Home Bundesliga Football Sports Bayern Munich Goalkeeper Manuel Neuer Injured Again! 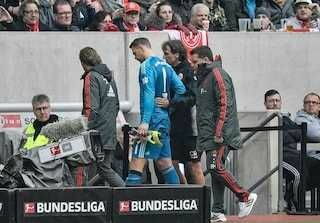 Bayern Munich Goalkeeper Manuel Neuer Injured Again! Bayern Munich Goalkeeper Manuel Neuer faces another lengthy spell on the sidelines after going off injured in the 4-1 win against Fortuna Dusseldorf. Neuer has missed two games alreadyin the second half of the season due to a thumb injury and left calf problem. The 33-year-old made only three league appearances for Bayern last season due to a hairline fracture in his left foot. Mats Hummels also limped off after the win in Duesseldorf. The Bayern defender appeared to have a hamstring injury. The 4-1 win continues a run of fine form in the league for Bayern, as they have taken 43 three points out of a possible 48 over their last 16 games. It has seen Bayern wipe out a points deficit to Dortmund and now has them a point clear of their title rival, while also possessing a vastly superior goal differential.